Enjoyed the surprising Christmas celebrations in the capital of Colombo, along with some nice fireworks to welcome in AD 2017. 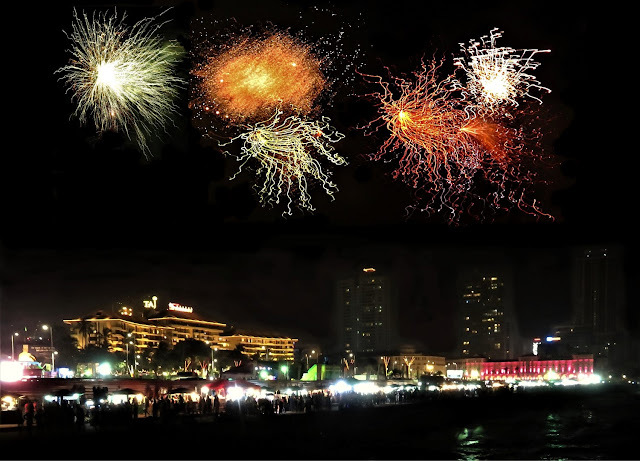 New Year's Eve fireworks above Colombo's crowded waterfront Galle Face green. 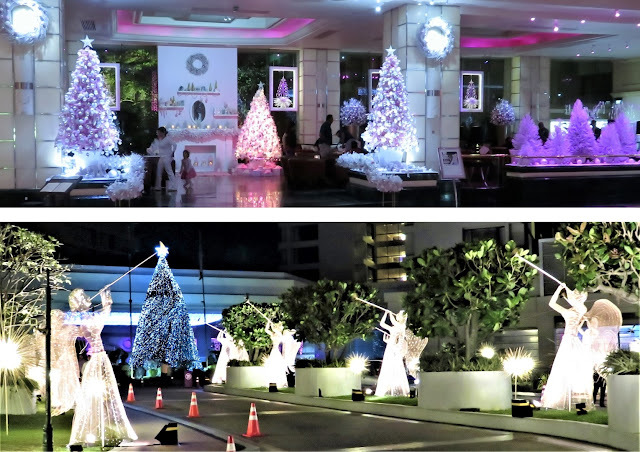 Only about one out of ten are Christian but central Colombo was filled with Christmas lights and decorations. My hotel had angels and trees everywhere. Sri Lanka, largely Buddhist, even unveiled the world's largest man-made Christmas tree (or rocket) at Galle Face ― around 24 stories high. 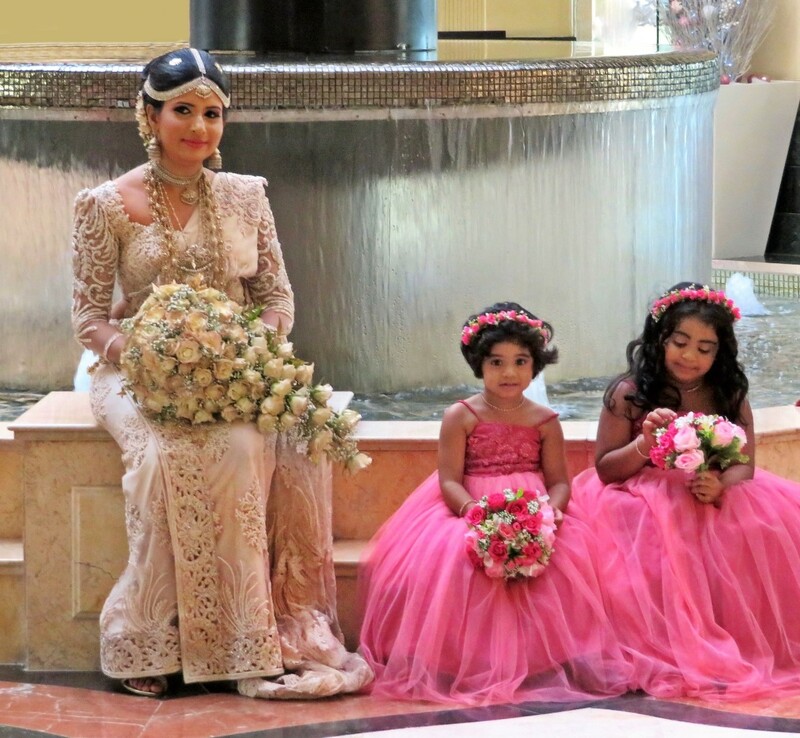 Lots of weddings at hotels. This bride, like others I saw, wears a classic ivory Kandyan saree and headpiece. 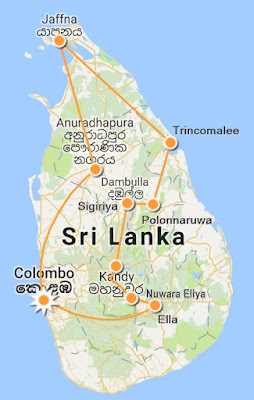 In my past two visits I'd enjoyed Colombo and the nearby coast (Galle up to Negombo) so much that I was lazy and never ventured elsewhere. This time I advance booked a loop around key and varied parts of the island. With luck, I got assigned Hirosh ― a cool, smart, easygoing driver/guide with a nice car to make the island tour very smooth, lots of fun, and always interesting. Not only was this sophisticated ancient city the first capital for 14 centuries, but because it was a major early center for Buddhism it is a pilgrimage site for adherents around the world. Pilgrims come to visit the numerous stupas and pagados (both old and new), sculptures, monasteries, and a Bodhi tree believed to be grown from a branch of the Bodhi tree under which Siddhartha acquired enlightenment as Buddha. Here is a sample of the many old Buddhist structures around Anuradhapura. 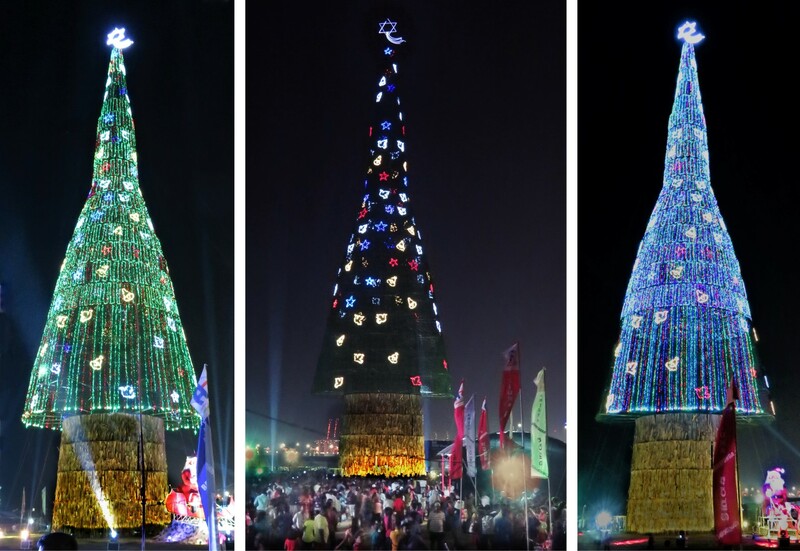 The enormous Ruwanwelisaya (night photo above) was the most impressive, over 30 stories tall and about 1,000 feet around at the base. Even larger is the brick Jetavananarama stupa, said to be the one of the largest structures of the ancient world as well as the largest brick structure in the world. 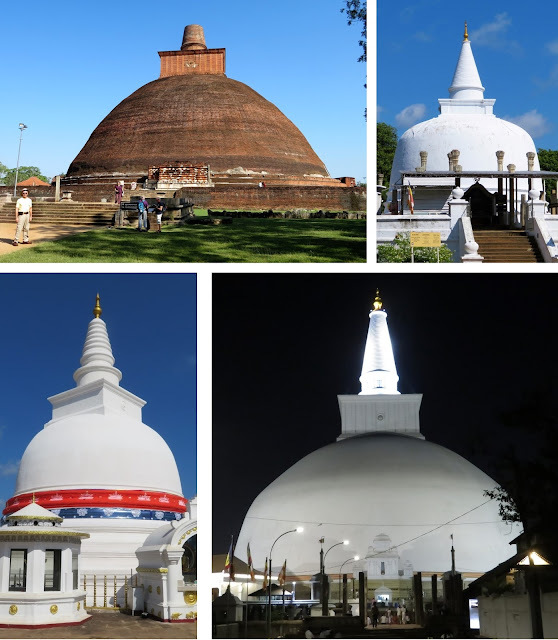 In Sri Lanka, they called these bell or bowl shaped structures "pagodas" although elsewhere I'd always heard this design called a stupa. Pilgrims viewing an ancient stupa. Left: Pilgrims from southern Sri Lanka. Right: Prayers at a temple by the Bodhi tree. A monk and two nuns enjoying the late afternoon breeze. My hotel failed to serve hoppers at breakfast but that evening we stopped at this fine roadside hopper stand to remedy that omission. 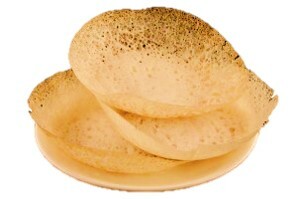 The best single Sri Lankan culinary treat has to be the hopper, a thin, crispy crepe made from rice flour and shaped like a bowl. Hoppers are often made with an egg in the center and served with various spicy sauces. Perfect at breakfast but good 24/7. Left: Well preserved guardian stone, protecting the gates of a temple. Right: Walking up to the many steps to Minitale. Rising out of the flat plane, Minitale is a mountain where a Buddhist missionary is reputed to have converted the king, ushering in the widespread practice of Buddhism in Sri Lanka. It is a highly venerated site. Buddha statue on top of Minitale. View of Aradhana Gala from the stupa. Some say the monk who brought Buddhism here flew out of the sky and landed there. Waiting for the train to Jaffna, this precocious little guy was eager to try out his English. At the northern tip of the teardrop-shaped island is the once-large Tamil Hindu city of Jaffna, ravaged by the thirty-year civil war of the Tamil Tigers against the majority Sinhalese Buddhist who dominate the rest of the country. Elsewhere, when asked about my travels, my mention of Jaffna provoked the most interest since for decades it was forbidden territory. Before the civil war, this now destroyed building was the central government's main building in Jaffna. The government may soon ban distracting messages on tuk-tuks. In the meantime, this tuk-tuk driver is painfully forthright about his reality. Legend claims a homely man became handsome after bathing here at the Keerimalai natural springs. So of course I had to try it. Sadly, I must report that it does not now have such transformative powers. The day's novelty (me) tries to match nonstop banter with these very funny guys. This dip in the pool produced this funny photo too, along with many rejected alternative captions. These young women were quite shy but were the first Sri Lankan females to request a photo. Cool. 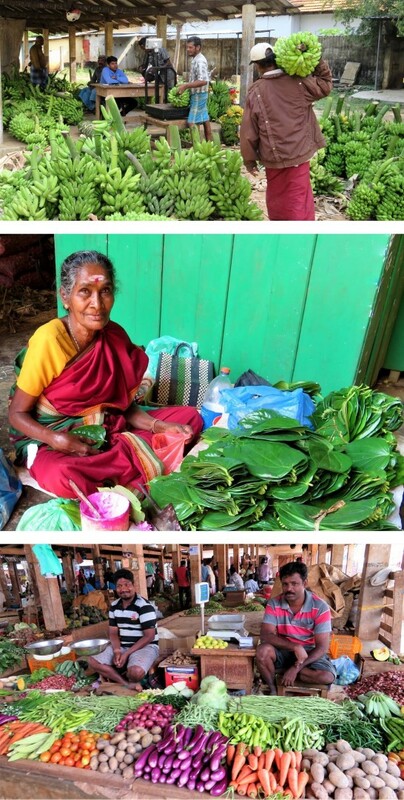 As usual, I'm drawn to the local markets. Unlike recent markets Chad and Niger where people were hostile to tourist cameras, folks in Jaffna happily agreed to be photographed. On the northeast coast, protected marine reserve of Pigeon Island (right) offered some nice snorkeling with sea turtles, tropical fish, and more fairly large sharks than I've ever seen cruising in my immediate vicinity. In another season, whales migrate through this area. 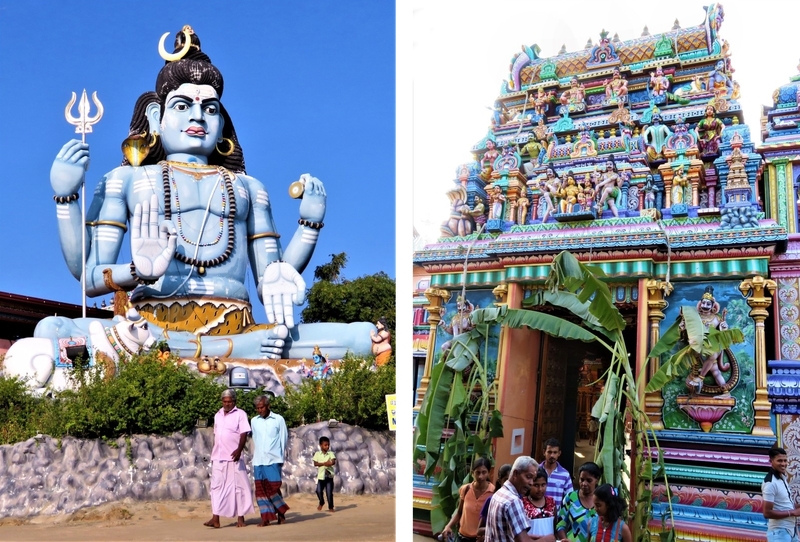 Restored ancient Koneswaram temple of Trincomalee featuring a giant Shiva statue. Had never seen so many wild peacocks. Blue peafowl live in the wild in Sri Lanka and India. The birds never paused and unfurled their tail feathers for my camera but I did manage to get this shot. 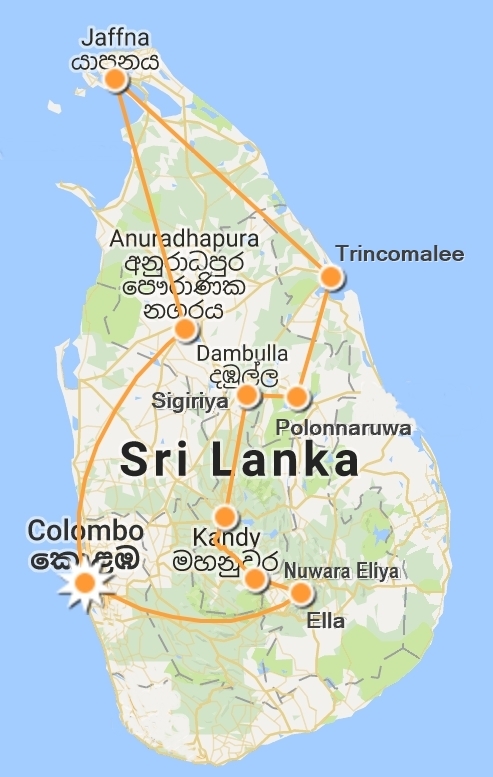 After Anuradhapura, the next great capital was Polonaruwa, which peaked in the 12th century. Again, impressive ruins mark yet another remarkable kingdom. The Polonnaruwa Vatadage with beautiful intact guardian stones. Circling an ancient stupa, Hirosh noticed this poisonous snake exploring the bricks. Speaking of Hirosh, he suggested lunch at Gami Gedara, an isolated family-run buffet beside rice paddies. Favorite meal of the journey (despite no hoppers). 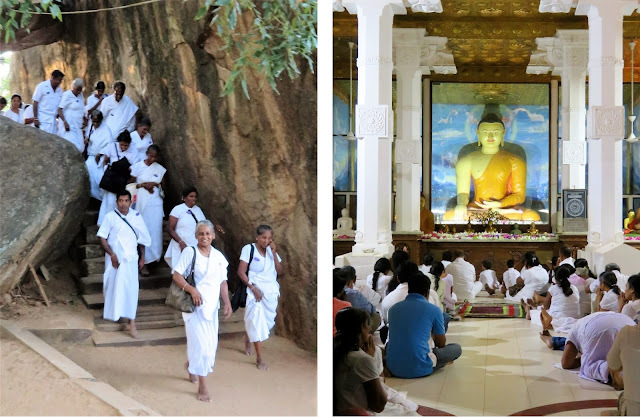 At Gal Vihara in Polonnaruwa are several statutes of Buddha carved out of the granite rock. Older woman on the right has her hands clasped to her head in prayer. Younger woman on the left snaps a pic on her phone. Sigiriya, the Lion Rock, is probably Sri Lanka's single most famous tourist destination. The old rock fortress towers some 660 feet (201 meters) above the flat plain below. A king had his palace up here about five centuries BC and it later became a Buddhist monastery. 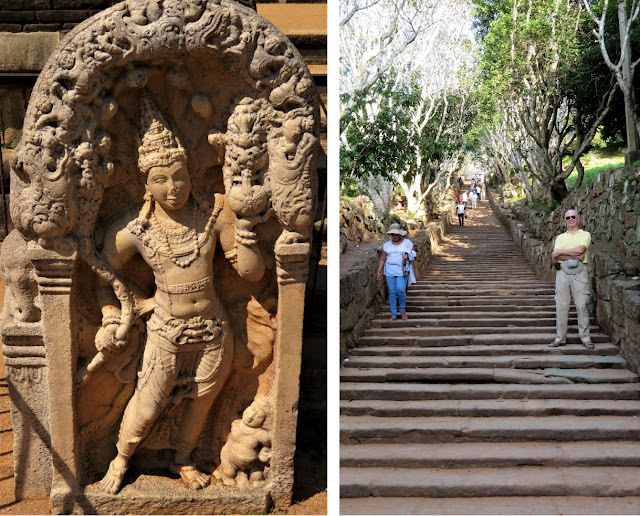 Getting ready for the 1,200 stairs to the top of Sigiriya. Glad we arrived as soon as Sigiriya opened. Would not want to be among packed crowds pushing along this walkway clinging to the side of the mountain. On top, lots of terraces and a nice view. Between Sigiriya and Kandy, are the Dambulla Temple Caves dating from 1st century BC. These five caves are packed with sculptures and paintings of Buddha, Bodhisattvas, a few Hindu gods, and others. Chinese tourist photographing resting Buddha. Tooth enshrined behind this door. The second largest city is Kandy, often called the country's cultural capital. Its most famous site is the Temple of the Tooth, said to possess a venerated relic, one of Buddha's teeth. Traffic in and around pretty Kandy is bumper to bumper for most of the day. But a hotel in the central city lets you conveniently enjoy the lake, temples, and restaurants by foot. 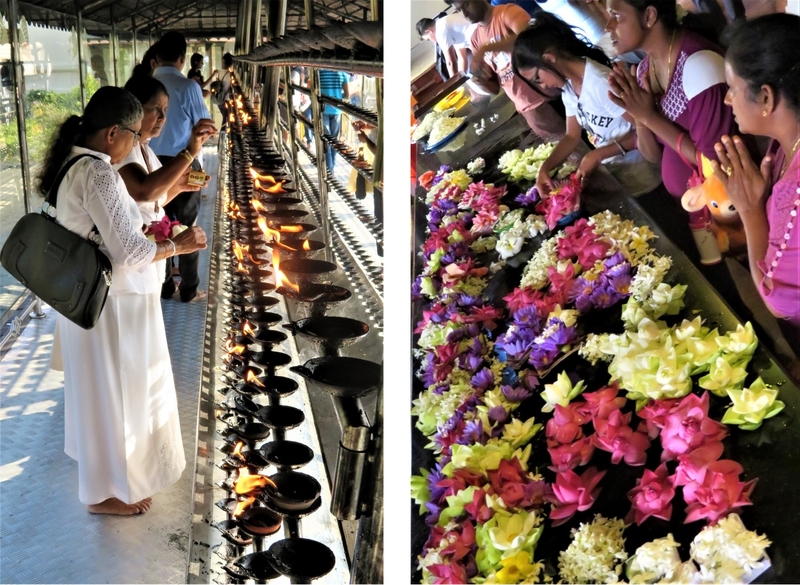 At Kandy's Temple of the Tooth, the faithful light candles and bring flower offerings. One evening I saw a nicely done show of various traditional dances. Hiking around Horton Plains, got a quick glimpse and lucky photo of the striking national bird ― the endemic Sri Lankan junglefowl (aka Ceylon junglefowl). Also on Horton Plains, we saw quite a few Sri Lankan sambar (aka sambur) deer, including this fearless, curious young deer. They are not quite moose proportions but big and muscular nonetheless. The highlands national park Horton Plains was plainer than I expected but we had a good, long, rocky, hilly hike to "Word's End." Upon arrive, we found a thick wall of fog, not the famous 4,000 foot precipice. Scenic mountain train ride from Nuwara Eliya to Ella. Better of course to be sad to see a journey end than to be happy it is over. And I was definitely sorry to see this one come to a close. Wished I'd had extra days at almost every stop throughout the trip. 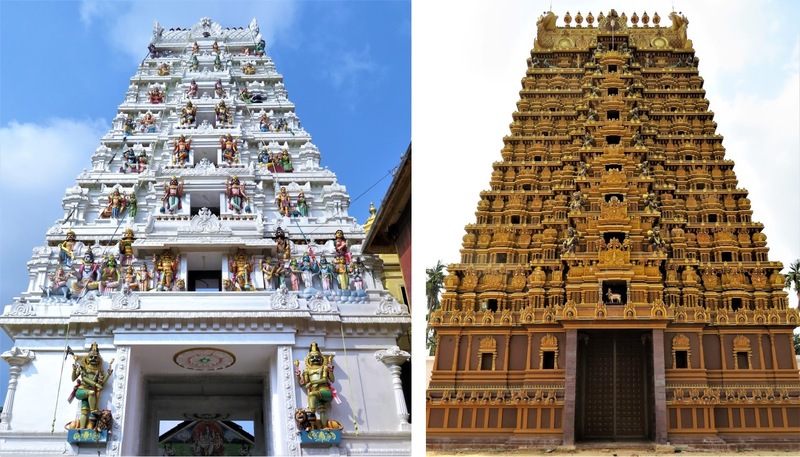 My infatuation with Sri Lanka continues having been ignited by my December '15 visit and continuing with my July '16 and now January '17 visits: interesting and varied sites, sweet and friendly people, unique and tasty food, congenial and novel cultures, and not bad weather (so far) and not yet overrun with too many tourists. Wonderful place to explore and enjoy.